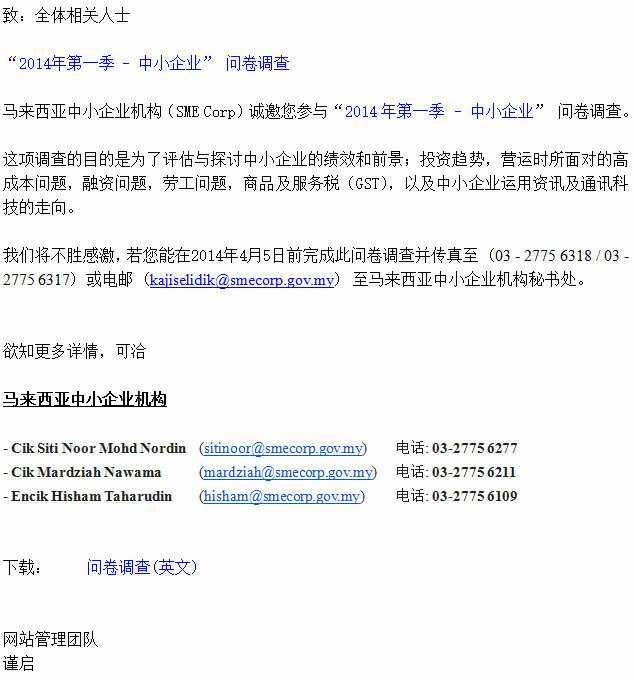 Please be informed that SME Corp. Malaysia invites your participation in “2014 First Quarter SME’s Survey”. The purpose of the survey is to assess the performance and outlook for SMEs; investment trends, issue on the high cost of doing business, financing issue, labor issue, Goods and Services Tax (GST) as well as on ICT adoption by SMEs. In light of that matter, SME Corp is seeking your kind assistance to invite members of your good organization to provide feedback. We would appreciate if you could return the survey form by fax to SME Corp at 03 - 2775 6318 / 03 - 2775 6317 or email to: kajiselidik@smecorp.gov.my by 5th April, 2014.